Petty Officer Henry James Greenwood killed at age 26. His father died on service last May. Lieutenant Commander Basil Stratford Noake (Royal Navy, HMS Begonia) is killed when his ship his torpedoed in the Bristol Channel. 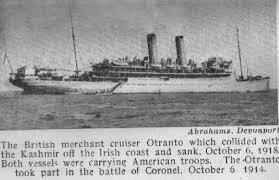 His brother will be lost at sea from the Ambulance Ship Elloria in 1919. Captain John J Tough (Royal Army Medical Corps) is killed in action when an enemy airplane drops a bomb on the 5th Field Ambulance at Flesquieres. He dies two years after his brother has been killed on the first day of the Battle of the Somme. Second Lieutenant Donald McLeod Innes (Black Watch) dies of wounds at age 19 at Vimy Ridge. He is the grandson of Lieutenant General James John McLeod Innes VC and a scholar of Repton School. He was an Exhibitioner of Trinity College, Cambridge. His older brother was killed in action in April 1917 also at age 19. Second Lieutenant Leslie Harold Perry MC (Gloucestershire Regiment attached Durham Light Infantry) is killed in action at age 19. He is the son of ‘Sir’ William Perry. Lance Corporal Betram Smart (Devonshire Regiment) dies on service in Bombay. His brother was killed in February 1915. Private Marcus M Miller (Canadian Infantry) dies at home at age 27. His two brothers have been previously killed in the Great War. Rifleman Percival James Mellon (London Regiment) is killed at age 20. His brother was killed in July 1916 while another brother will be killed in two days. Private Harold Francis Wright (Gloucestershire Regiment) dies of wounds at age 27. His brother was killed in May 1915.